He's back. And he's still the same, only more unpredictable than before. Twenty years after BOULEVARD, 15 years after the multi-platinum album TOURIST (over 3 million copies sold worldwide) and a world tour spanning several continents, Ludovic Navarre, alias St Germain, finally found his way back into the studio. This new eponymous album is a colourful and exceptional musical journey. 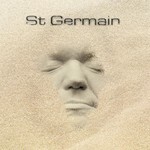 Recorded with the participation of African musicians, the album features traditional Malian instruments like the kora, the balafon or the n'goni, that mingle with electric guitars, pianos, saxophones and electronic loops, following a secret formula only St Germain could concoct.